Despite its name, coconut milk is quite different from dairy milk. It's high in fat, but it's also cholesterol-free and rich in many nutrients. Because it's not derived from the milk of animals, coconut milk is lactose-free and can be a perfect alternative for people pursuing a lactose-free diet. Lactose is also known as milk sugar. It is produced in the milk of mammals, including cows, sheep and other animals used to make dairy products. Pregnant women produce lactose in their breast milk. When babies are born, their digestive tracts are equipped with lactase, the enzyme needed to digest lactose in their mothers' milk. However, the digestive system's lactase levels diminish over time, resulting in lactose intolerance. As a nondairy product, coconut milk is free of lactose. Although it's rich, creamy and indulgent, it is not a concern for people who need to avoid dairy -- and that's a lot of people. About 30 million American adults experience lactose intolerance symptoms including bloating, cramps, diarrhea, nausea and gas. Choosing coconut milk over dairy for cream sauces, curries, desserts or other dishes can offer a rich taste along with nutrients and fiber. Opting for coconut milk over dairy milk is a surefire way to avoid repercussions. However, sometimes occasions arise when avoiding dairy is difficult. For example, when dining out, it's possible lactose may be hidden in many dishes that appear dairy-free. Or, perhaps utensils used to make your dish also touched a cream sauce. Other situations may include cake-filled birthday celebrations or other occasions. In these instances, there are over-the-counter lactase supplements to get you through the day. Coconut milk's indulgent texture makes it an appropriate substitute for cream. Try it in creamed spinach or other creamed vegetables, or as part of a breading for fried chicken or fried coconut shrimp. Coconut milk is popular in Asian dishes, including curries and noodle dishes. 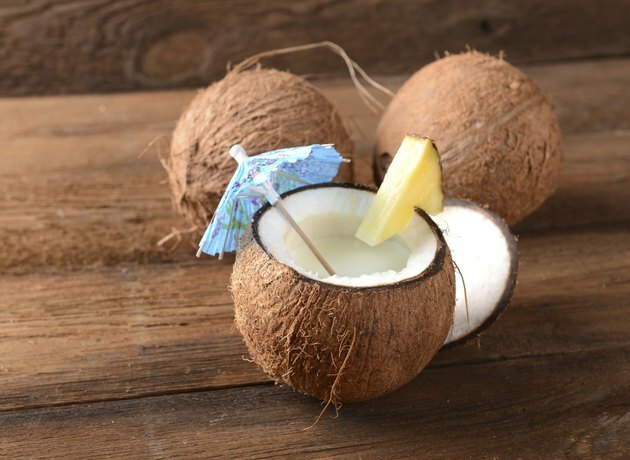 It's also well-known for its role in pina coladas and other tropical drinks. Coconut milk is an increasingly popular ingredient in desserts like dairy-free pudding, glazes, dairy-free yogurts and ice creams. Does Heavy Cream Have Lactose?